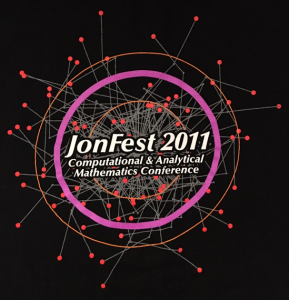 Back in the Spring of 2011, I attended JonFest at IRMACS, a conference marking Jon’s 60th birthday. Part of the swag was the following T-shirt, with a background of what I was certain was a visualization from some of Jon’s (at-the-time) recent work. It was often on the presentation monitor between speakers, and during conference lulls I tried to construct theories around what it might be visualizing. After exhausting mathematical ideas, I moved onto more symbolic ones, and my favourite of the latter was the following: the center circle was Jon’s brain, and all of the nodes were ideas. The outer circles were those around him, his students, colleagues, and collaborators, who if they happened to be thinking of the right thing and happened to be talking to the right person at the right time, would catch one of them to help direct or complete their own thoughts. And the outer circle was the research community, who saw his results in publication or conference form, and were able to apply it to advance their own work. From 2000-2008, I had the privilege of existing between the inner and outer circles. I came from a modest background, and it was hard not to be overwhelmed by my first experience at the lab, and by the active atmosphere of research always present at the welcoming home that Jon and Judy had made together as a grounding point for the research community there. Ideas felt endlessly present in the lab, like the air – you felt like you could breathe them in if you worked hard enough. The endless stream of distinguished visitors was a compact introduction to the breadth of knowledge in the world, all of whom came to Jon’s door to gain from his insight. Jon was the father figure of the community, someone who aimed to welcome and not to overwhelm newcomers, with the knowledge that the younger academics were the potential future stars. As his students, we would often be on “Jon-duty”, keeping an eye out for when he was between meetings or collaborations, willing to walk beside him wherever he was going knowing that even a 5-minute conversation would save us endless hours of investigating wrong directions. The ambition of his vision knew no bounds and was directed by his natural intuition and his joy at the thought of a given idea working: Use improved Math OCR to digitize all of the mathematical literature? Let’s try it! Enhance mathematical experimentation by building the functionality for active programs to run inside a digital book? That would be fantastic! I was reminded of this again at JonFest, which often felt like a conference filled with an incredible diversity of mathematical areas, in which the two leading experts were always the speaker and Jon. 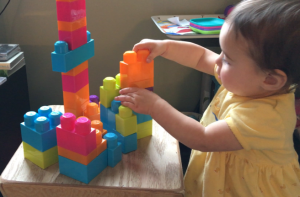 As a father myself now, I look at my daughter Ada and I see only potential. She is a mystery to me, with isolated moments (of increasing frequency) where she peeks out from behind the curtain of her youth to yield her future personality and identity. I often watch her and wonder what she will become, who her future self will be and what she will accomplish. My image of the father that I can work hard to be is shaped by my time working with Jon, and my dreams for her future are made greater than the limits my modest upbringing, by the honor of seeing through Jon what the real boundaries of human potential and accomplishment look like. As rich as his scientific and mathematical achievements are, he made all of us who worked with him better people for the experience.